The Biblical account of the division of Israel into two “houses” or kingdoms in the time of King Rehoboam of Judah is of great prophetic significance right up to our own day. The leadership, or birthright, of Israel was originally given to the Patriarch Joseph (1 Chron. 5:1-2), and then to his son Ephraim and his descendants of the Ten Tribe Northern “House of Israel.” Yet a significant temporary transfer of leadership took place during the time of King David, who was of the tribe and “House of Judah.” David and his son Solomon ruled over all twelve tribes of Israel until Rehoboam, Solomon’s son, came to the throne. Then the Ten Tribes of the House of Israel separated from Judah and chose Jeroboam of the tribe of Ephraim as their king instead. In the Hebrew text of 1 Kings, Jeroboam is referred to as “nagid,” meaning a “crown prince or designated heir.” In other words, he became the Israelite birthright holder! Professor James Richard Linville, in his book, “Israel In The Book of Kings,” asks “…does the transfer of the nagid-ship [i.e., kingly leadership] to the North[ern Ten Tribes] reveal a loss of legitimacy or status for Judah? …granting Jeroboam the title once held by David, and then even passed it on to another Northerner.” The Bible indeed seems to be indicating that the birthright, or right to rule God’s people, was transferred back to the Joseph tribes of the House of Israel. This transfer of the birthright, first from Joseph’s descendant Saul to David of the House of Judah, and later back to the House of Israel, can be seen in prophetic symbolism. Few realize the significance of the tearing of a robe as a sign of termination. This action figured prominently in the removal of Saul as king. We read of this in 1 Samuel 15:26-28: “And Samuel said unto Saul, I will not return with thee: for thou hast rejected the word of the LORD, and the LORD hath rejected thee from being king over Israel. And as Samuel turned about to go away, he laid hold upon the skirt of his mantle, and it rent. And Samuel said unto him, The LORD hath rent the kingdom of Israel from thee this day, and hath given it to a neighbour of thine, that is better than thou.” King Saul’s sins caused the kingship and birthright rulership to pass to the House of Judah. [inset side=”left” title=””]”the Joseph tribes of the northern kingdom were conquered by Assyria, and exiled from the land of Canaan as “lost tribes” to other lands”[/inset]The Prophet Ahijah later performed this same significant ritual in the tearing of the Ten Tribes of the House of Israel from the rulership of Rehoboam, king of Judah. We read of this in 1 Kings 11:29-31, “And it came to pass at that time when Jeroboam went out of Jerusalem, that the prophet Ahijah the Shilonite found him in the way; and he had clad himself with a new garment; and they two were alone in the field: And Ahijah caught the new garment that was on him, and rent it in twelve pieces: And he said to Jeroboam, Take thee ten pieces: for thus saith the LORD, the God of Israel, Behold, I will rend the kingdom out of the hand of Solomon, and will give ten tribes to thee.” Thus the transfer of leadership, nagid, or birthright took effect from Judah back to Ten Tribe Israel. The kingdom of the House of Israel existed for over two centuries, from 930 B.C. until the fall of Samaria in 722 B.C. Then the Joseph tribes of the northern kingdom were conquered by Assyria, and exiled from the land of Canaan as “lost tribes” to other lands. The House of Judah, however, remained in Canaan except for a 70 year Babylonian exile from which they alone returned in 538 B.C. Once again Judah had obtained by default the birthright and rulership of the land of Canaan. The rending of his garment by the Jewish High Priest provided a second New Testament witness signifying that the kingdom of God and prophetic birthright was transferred from the House of Judah at the time of Christ. 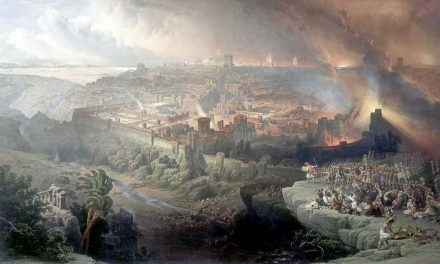 The Roman conquest and destruction of 70-73 A.D. was the death-knell for the House of Judah’s rulership of first-century Palestine. What does it mean to say that this kingdom was ‘taken’? The Hebrew Gospel of Matthew, translated by George Howard, is believed to be a Hebrew version of that gospel dating to the time of the Apostles. It translates: “…the kingdom of heaven shall be torn from you and given to a nation producing its fruit.” Like a torn garment, a kingdom that is torn away is removed from its prior status and location. The kingdom of God would no longer be found in old Canaan, but be ‘taken’ or removed to another place. Who was this kingdom ‘given’ to? The word, “fruits,” in the text is a prophetic key; in the Hebrew language the word, “Ephraim,” means “fruitfulness.” Their name is the key to their identification. Ephraim-Joseph and their descendants were the promised inheritors of the birthright, as we previously pointed out (1 Chron. 5:1-2). In order for numerous latter-day prophecies concerning Israel’s birthright promises to be fulfilled, God had removed a section of Israel from Palestine to other lands so that they could be fruitful as believers in Christ and represent His kingdom on earth! Where are they in the world today? The continuation of the House of Israel (Ephraim-Joseph), as well as a portion of the House of Judah and the Davidic line, took place in lands of the West. This is discussed in detail in W.H. Bennett’s, “Story Of Celto-Saxon Israel,” available from CBIA’s online bookshop at www.migrations.info. It is a fascinating and inspirational historical account, well worth reading in order to understand crucial Biblical prophecy concerning latter-day Israel. May God bless your study of this important prophetic question.